Aw, summer time. The time of year when we take a deep breath, relax, join curriculum planning teams, and prepare for the upcoming school year. As we sip our lemonade and reflect on a year’s worth of teaching and learning, the dreaded thought of students not rehearsing the knowledge and skills they gained during the year may become a reality. 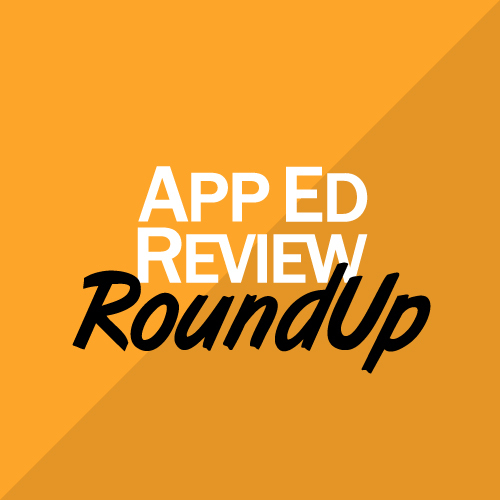 Well, if that thought is floating around in your head, App Ed Review is here for you! In this month’s RoundUp, we will highlight some of our favorite resources – both apps and websites – that students can use on their own this summer to keep their brain active during June and July. And remember, for each website or app that we review, we include: an extensive evaluation of it using our validated rubric, 3-5 instructional ideas about how teachers can use it immediately in their classroom, and an original description. If you would like would more ideas about the resources mentioned in this RoundUp or would like to research additional apps and websites, come check us out at www.AppEdReview.com. Dapp Free is an app designed to build other apps. With it, students can create apps ranging from being simple in nature to being very nuanced and innovative. However, unlike other similar resources, this app provides easy-to-follow tutorials for students as they begin to design and create their own app. When finished, students can test out their app and Dapp Free. When ready, the app supports students in sending their xcode to the App Store, which begins the process of students being able to publish their app. The benefits we see in Dapp Free is that teachers can recommend it to students who are interested in computers and technology, and students can work on creating their own app during the summer months. Earning high scores for its engaging features and rigor of thought, Dapp Free has the potential to engage students in higher order, technical thinking during summer break! To learn more about Dapp Free, click here. Good Reads is one of our favorite go-to resources for choosing new books to engage. Essentially, Good Reads is a social platform where users – students, parents, teachers, and more – read, rate, and recommend books. We like Good Reads because the volume of different recommendations encompasses such a large amount of genres and time periods that all students are highly likely to be able to find a text to read. Furthermore, over the summer months, we know how important it is that students continue reading, and Good Reads supports reading over the summer because students can find a book that interests them and motivates them to read. Just by reading, students are keeping their brains active, which will prepare them when school resumes in the fall. To gain additional information about Good Reads, click here. Jimi Hendrix: The Complete Experience is an unusual pick for this category, and we selected it because it may ignite a passion for music that students can explore over the summer months. Essentially, this app is an interactive biography dedicated to the life and works of Jimi Hendrix. Though students may not have as much background information about Hendrix as previous generations, this app’s engaging design may captivate students’ attention and inspire them to either study other famous musicians or spark them to pick up an instrument and begin practicing it over the summer. We all know that music and reading are both higher-order thinking skills, and its our hope that students will use them as they engage this app. Click here to access more information about the Jimi Hendrix: The Complete Experience app. TinkerBox HD is a fascinating app that presents puzzles to students that they can solve by applying different physics and engineering skills. Though no accountability measures are included in this app, students can use it independently to complete puzzles during their leisure time. Because of this app’s game-style design, students will be learning and applying the different laws of physics, which will keep them fresh in their mind over the summer months. TinkerBox HD earned very high scores for its ease of use, interactivity, and navigation, which are sure to make it appealing to students. For more information about this app, check out its review by clicking here. That’s all for this month’s Roundup. If you would like more information about any of the resources mentioned here or that are on the App Ed Review website, please contact us at [email protected]com. And remember, just because it is summer doesn’t mean that learning stops!